I want to grant complete pardon to the souls that will go to Confession and receive Holy Communion on the Feast of My mercy. 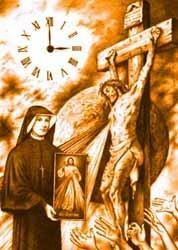 (Diary 1109)As you can see the Lord's desire for the Feast includes the solemn, public veneration of the Image of Divine Mercy by the Church, as well as personal acts of veneration and mercy. The great promise for the individual soul is that a devotional act of sacramental penance and Communion will obtain for that soul the plenitude of the divine mercy on the Feast.